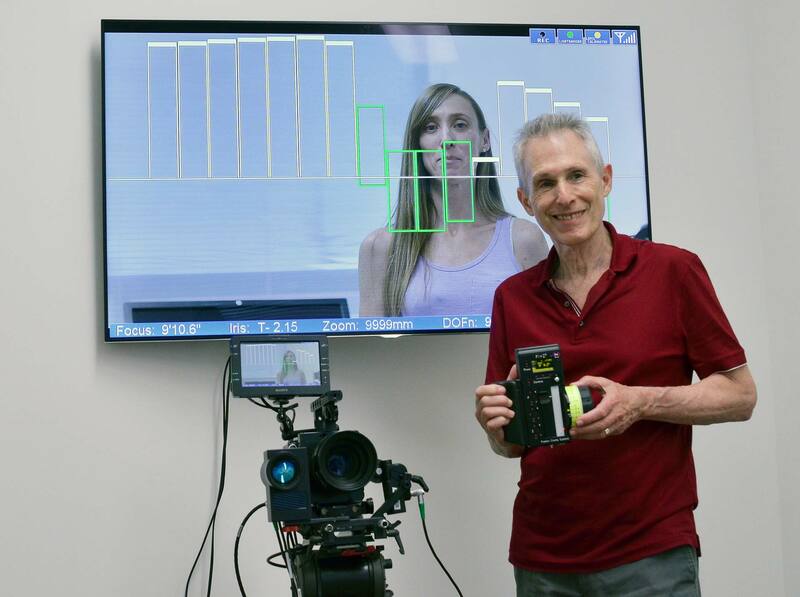 Howard Preston is at BSC Expo and AFC Micro Salon demonstrating his new patent-pending Light Ranger 2 (LR2). Howard calls it a “critical focus tool for the digital world.” You still work with your familiar FIZ. The LR2 intuitively guides focus-pulling in the correct direction, near or far. You confirm this by viewing almost any monitor, which gets a graphical overlay from the LR2. The thing works in a number of modes: manual, autofocus, or basic distance measuring. 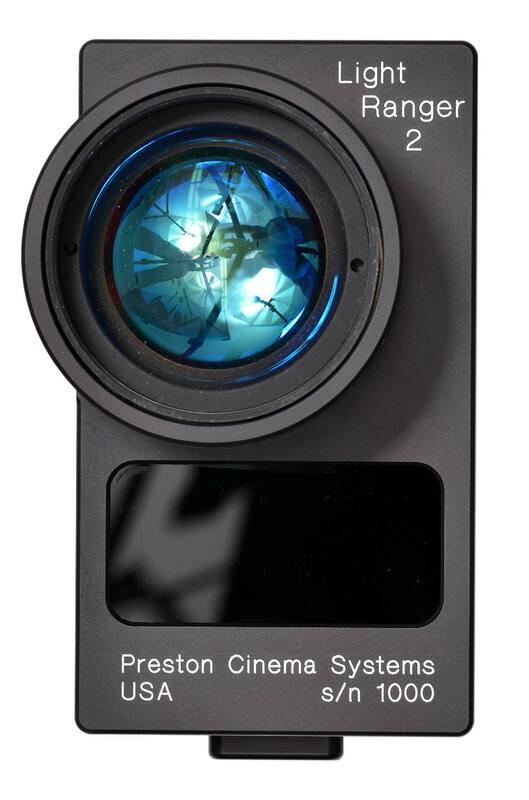 Preston Cinema Systems’ Light Ranger 2 consists of 2 parts. The Video Overlay Unit (above) attaches to the back of almost any monitor. 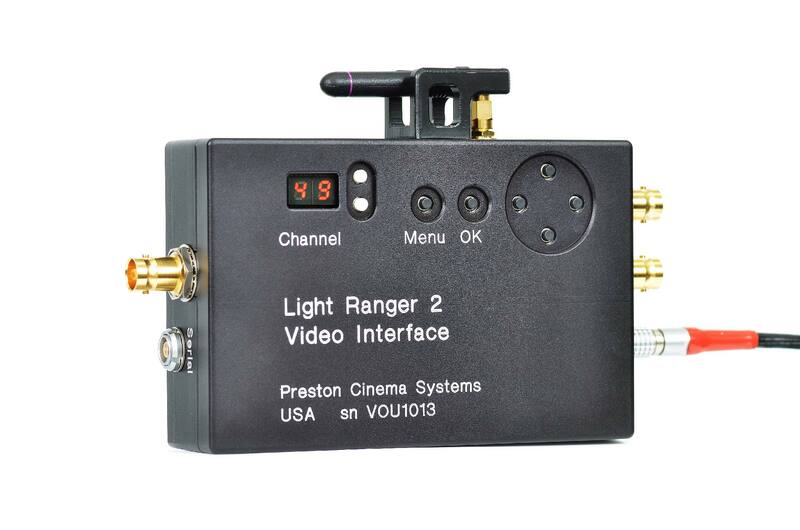 It receives focus information from both the Light Ranger 2 and the Preston FIZ HU3 Hand Unit. The Sensor Unit (below) attaches to the camera. The sensor unit sits atop the camera, preferably above the lens, but it can be placed anywhere that’s convenient. A quick setting calibrates the offset. A beam of infrared light from by the Light Ranger 2 bounces off the objects in the scene, and is captured by the detector array behind the unit’s lens. It’s safe infrared. There are no lasers, no ultrasonic signals, no transponders attached to actors. Light Ranger 2 works with the Preston Wireless FIZ system HU3 hand unit and MDR3 motor driver. Plug the Serial port into your MDR3, power it up, aim, calibrate, and shoot. You still control focus the way you always did. The Light Ranger 2 divides the video monitor into 16 zones, like a bar graph. Rectangles above the horizontal line show areas behind your established distance. Rectangles below are in front. This graphically shows which way to turn the knob of your wireless FIZ hand unit. Areas that are in focus are shown in green, and take the lens depth of field into account. 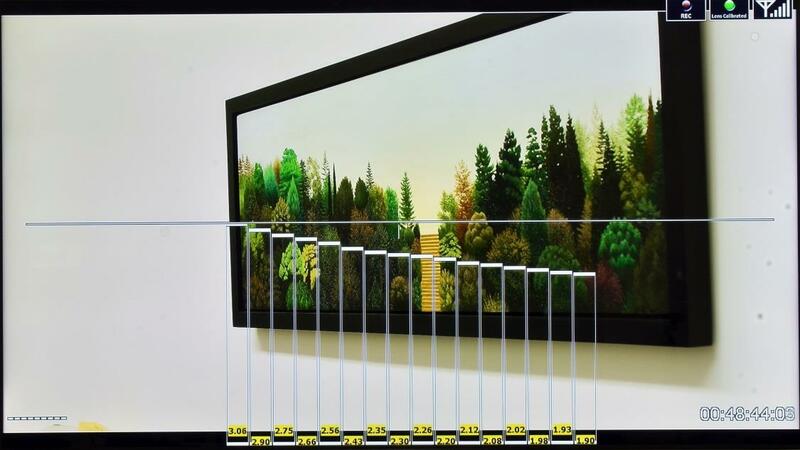 In Manual focus mode (above), distances are shown with 16 rectangles. The height of the rectangle above or below the center line tells you whether the subject is in front of, behind, or within the lens depth of field. Subjects within the DOF are identified with green rectangles, otherwise the rectangles are white. In Autofocus mode (below), a red rectangle shows where the distance measurement is taking place. The width of the rectangle is controlled by the north-south axis ↕ of the HU3 navigation key. The horizontal position of the rectangle is controlled by the ↔ east-west axis of the navigation key. You can make a smooth move from autofocus to manual control. See the picture above and the two different “Lens” and “Knob” readouts. 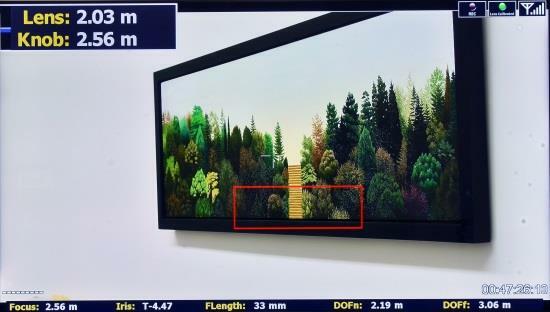 In this example, it’s telling you that the lens is autofocused at 2.03 m (Lens). But your FIZ knob is set to 2.56 m. If you switch from auto to manual at this point, the focus barrel will jump to the position determined by your FIZ hand unit knob. 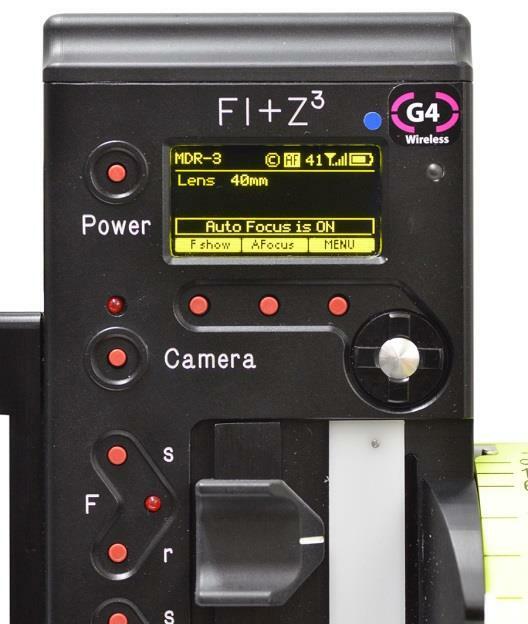 To avoid a focus jump when changing from Auto to Manual mode, the focus knob (Knob: 2.56 m) should be turned from 2.56 to 2.03 m so that its distance matches the lens setting (Lens: 2.03m). Next, exit autofocus mode using the HU3 softkey. The Basic Range mode shows distances from the camera’s image plane to the subject. The vertical bars show distance graphically, and the numbers below each bar show the distance numerically. Calibration: Menu driven, using focus target or manual offset entry. These specifications are preliminary and subject to change.